Mobile Home Weatherization covers issues specific to manufactured housing. After an introduction to mobile home construction, students are shown how to conduct duct-work diagnostics and repairs, retrofit a mobile home belly with insulation, insulate sidewalls and roofs, and check heating systems. 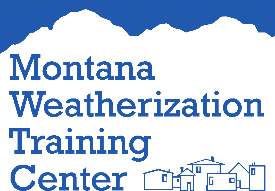 The course follows the Department for Energy’s standardized curriculum for Weatherization Installer/Technician Mobile Homes and has been modified to align with the NREL Job Task Analysis for Retrofit Installer Technician. The structure of the course includes lecture, dialogue and practical experience through hands-on skill sets. This course has 32 contact hours and can qualify as 16 continuing education units (CEU) toward Home Energy Professional Recertification. This is a lecture-lab course. Lecture topics are presented in the classroom setting followed by hands-on practice in the indoor training lab. The training lab houses a life size mobile home used to practice basic mobile home weatherization skills. Student participation in discussions in the classroom and in the lab exercises is very important. This course has a written final exam and student participation is graded as pass/fail.